This guide explains how to import a rubric or grading form into Turnitin. You may wish to do this if you have a colleague who has shared a rubric (.rbc) file with you for you to edit and re-use within your own Blackboard-Turnitin account. This guide assumes that you have been sent a .rbc rubric file already and that you have saved this file to your hard drive. Note that when a rubric is exported and then imported, the imported rubric is treated as a completely new rubric and has no connection to the original rubric (i.e. the one which your colleague exported). As a reminder, rubrics and grading forms are attached to your user account rather than to a specific course. 2. 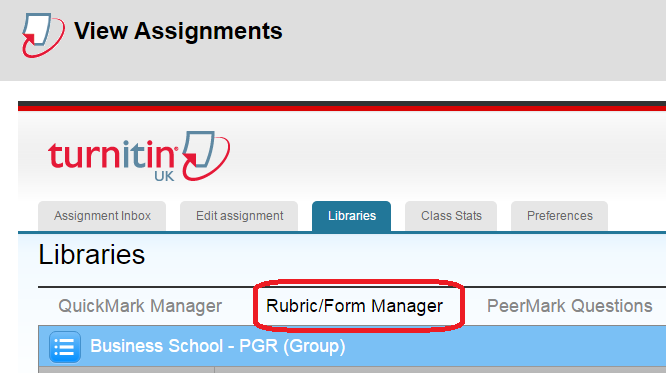 Click on one of the Turnitin assignment listed so that you can see the assignment inbox. 5. Click on the Import/Export icon in the top right of the Rubric/Form Manager screen (this appears in the blue bar on that screen). 7. Click on ‘Select Files’ and locate the .rbc rubric file which has been sent to you. 8. You should see an on screen confirmation that the rubric has been imported.